I had the pleasure of being over at Fireflies & Jellybeans on Friday, and this is the project I shared with her readers. I hope you enjoy it, too! After completing the entertainment center we built for our basement, I was in desperate need of some baskets to go on the shelves behind the doors. I love baskets, and don’t mind spending a little more on nice ones if they are going to be in a prominent place. However, these would be hidden behind doors, and would be in the throes of the basement, so I just didn’t want to spend a lot on them. So, I went on a hunt to find baskets for around $5–I knew I could paint them or jazz them up somehow, as long as they were the right size and shape. I went everywhere, and had absolutely no luck. I ended up at Walmart last, and when I couldn’t find anything there, I headed to the organization section. 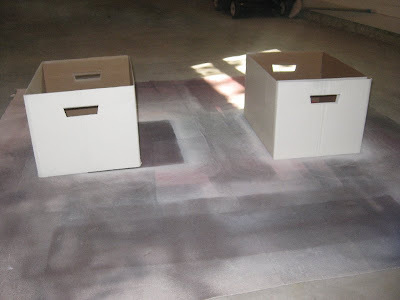 When I saw these sturdy moving boxes, I knew just what I wanted to do! 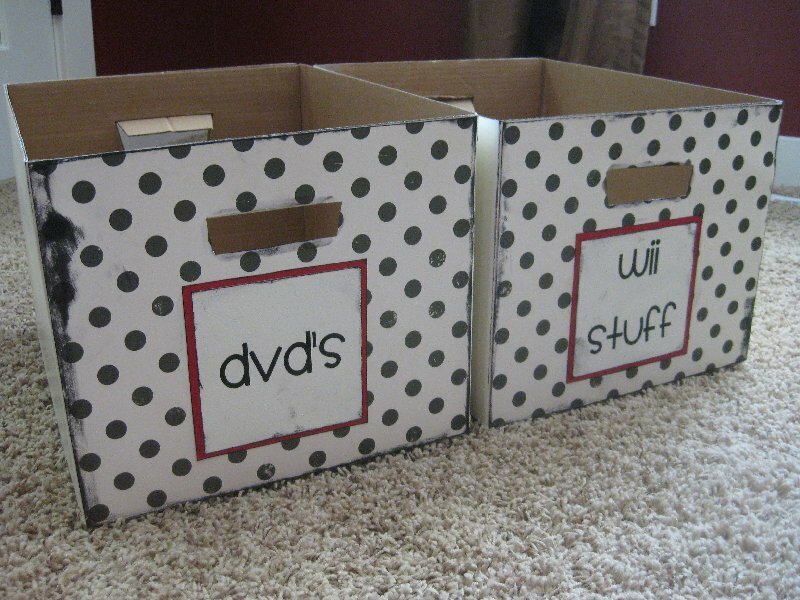 These “cardboard box baskets” are perfect. They are darling, sturdy, and cost less than $3 a piece to make. I love how they turned out, so I now I need to make one more to fill the whole space. They are SUPER easy to make–this is how I did it! 1. 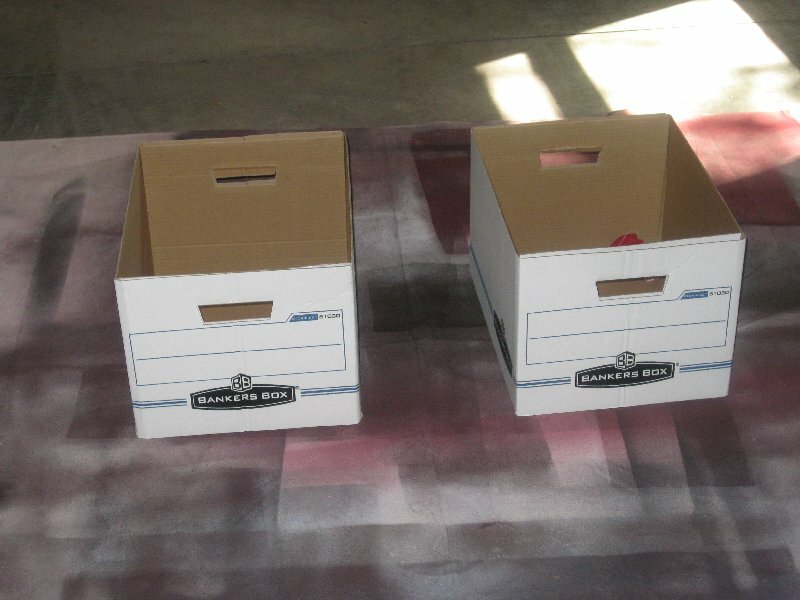 Spray paint boxes. It took 2 coats and 1 can of paint to do two boxes. It will just depend on the color of your box, and if there is any writing/graphics. 2. Print out desired text on cardstock. Cut it out, distress the edges, and mat it on a coordinating piece of cardstock. Distress edges. 3. Cut your scrapbook paper to fit entire front side of your box. Take a tiny bit of tape to hold the paper on the box, then trace the handle opening on the inside of the box, so you will know where to cut. Cut out the handle opening, then secure the entire piece of cardstock on your box. Distress the edges of the box and paper. 4. 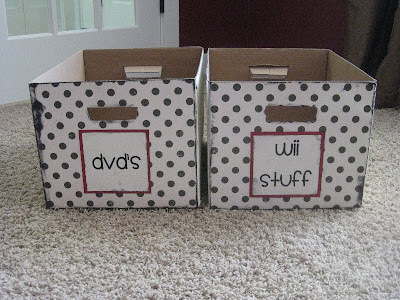 Using the double stick tape, attach your printed text to the box. Ta-da!! You have darling, simple, and cheap cardboard baskets that you can use anywhere. 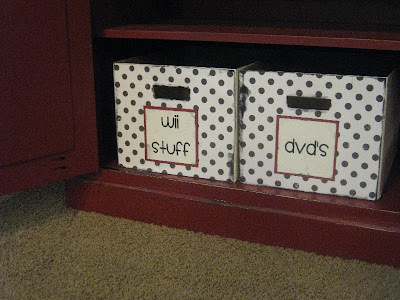 These would be great in closets, the garage, pantries, or inside furniture doors. LOVE this idea…baskets can be crazy expensive and I hate the plastic ones…great project. Love them! I wrapped burlap around some diaper boxes for the same reason! Glad to knoe the paint didn't rub off–that would have been a bummer. Never knew file boxes could look so cute. What a great idea! Amanda–a 12×12 piece of paper fits exactly the width of the box, so all I had to do was trim a little of the top to fit the height of the box. Super easy–I promise you won't mess it up! Plus, even if it doesn't fit exactly (like if your box is a little bit bigger than mine), I would just center it in the middle of the box, and have a little border around the paper. 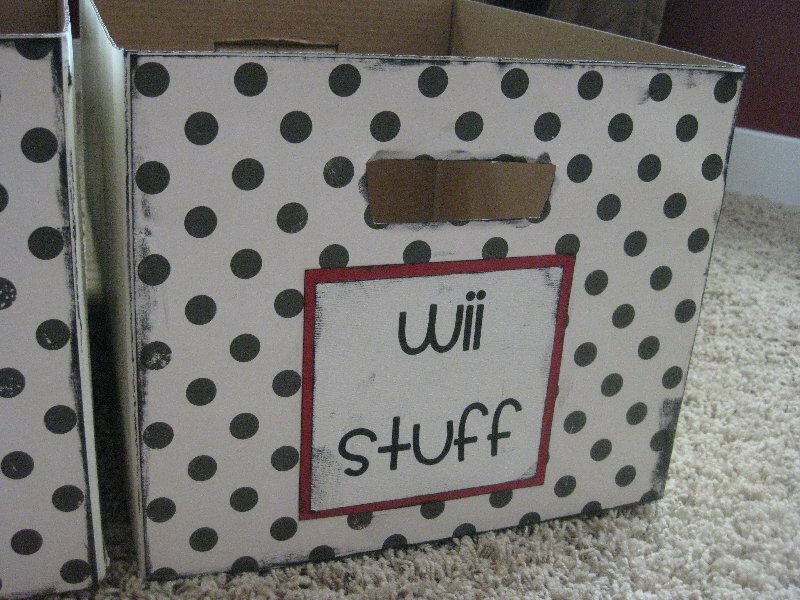 It would look super cute, especially because the box is painted. Just wondering what font you use for the labels? It's quite gorgeous! Love all your work! I am waiting for some formula cans of my friend to make the twine tins! The box baskets look great. 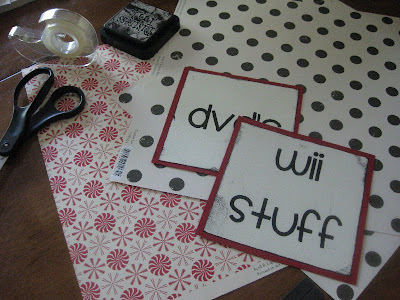 I'm having We're Organized Wednesday link party this week. I hope you can join and there's also a giveaway. how cool I think I might make some myself!! I LOVE these! I actually started one over the weekend. My box was too deep for the shelf, though, so I'm planning to post a tutorial for cutting a few inches off and then linking to your tute for how to finish it off. I hope that's ok. Thanks for the inspiration! Fabulous! I'll give this a try, could really use some cute storage in my mudroom. So cute. You are so clever. I love these boxes! I featured them on my site to share with my readers. Please stop by and check it out. I really love this!! I want to try this with some of our toy clutter. I was wondering if you thought painting over a bright diaper box would work? 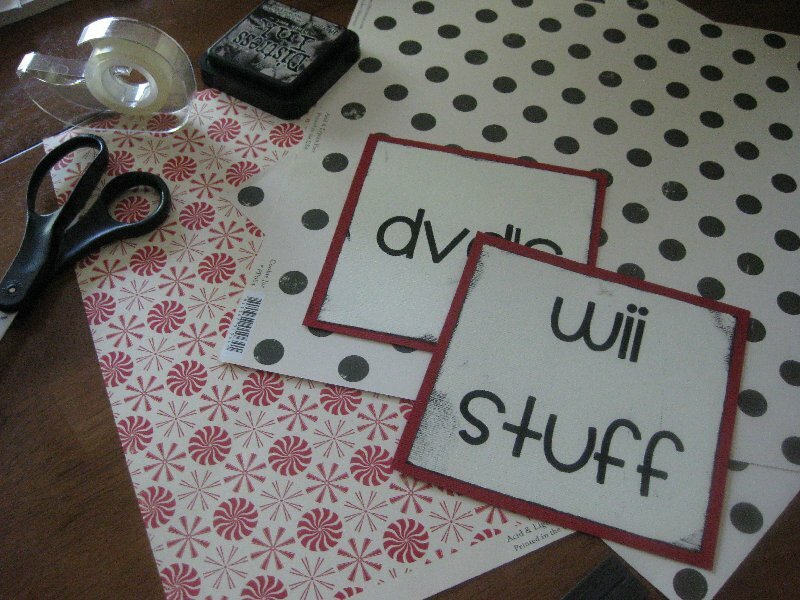 Also, have you used mod-podge to cover over the scrapbook paper? I know my kids would probably end up tearing the paper if it is taped on. Thanks so much. I just found your site and have looked at almost every single project. I just love your ideas and style.